Steven (Chicagoland, United States) on 5 December 2012 in Art & Design and Portfolio. 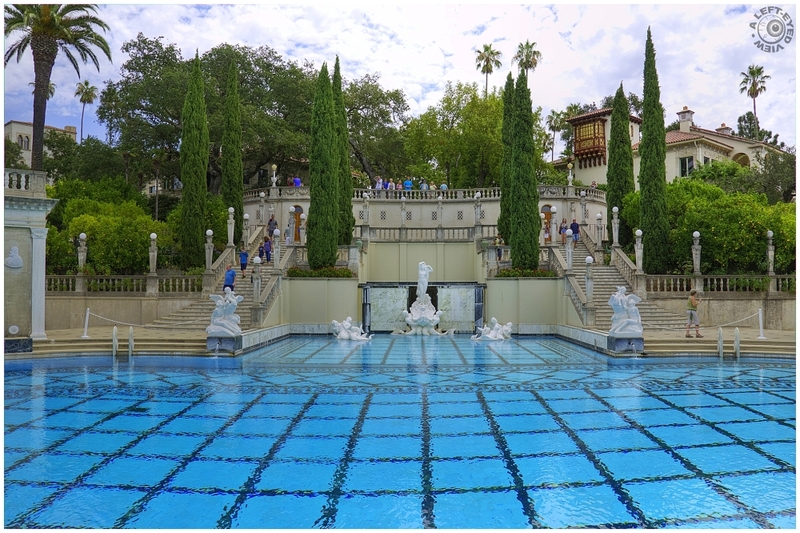 A view of Neptune Pool (with Hearst Castle in the background). The second version of the pool, a substantial enlargement, was created in 1926-1927. This version had a series of concrete steps at the southern side called the Cascade, down which water flowed. The Neptune and Nereid statues, presently in the temple pediment, then stood at the top of the Cascade. The dressing rooms were begun in 1928 and furnished according to Hearst’s instruction. The present version of the pool was under construction from 1934-1936. It is unlikely that the enlargement was done to make it closer to Olympic size, as has sometimes been conjectured; Olympic pools are 165 feet long. It is more likely that the colonnades and Cassou statues, which were planned from the late 1920′s, required an enlarged treatment. Morgan anticipated further modifications of the pool for Cassou’s Neptune statuary group to be placed in the small upper pool. On July 27, 1936, Morgan wrote in a letter to Charles Cassou, “enclosed is a plan and some photographs of the ‘Neptune Pool’ in its present (uncompleted) state. The recess of the main pool and the small pool above to receive your ‘Neptune’ group I have not touched since my visit with you last year – so please do not think of them except as something yet to be done to form a proper background and sitting for your ‘Venus’ as well as your ‘Neptune’ statuary.” The “Neptune” sculpture group by Cassou intended for the small upper pool was never installed. The final version of the pool as it stands at the Castle today is 104 feet long, 58 feet wide and 95 feet wide at alcove. It is 3.5 feet deep at the west end, 10 feet at drains and holds 345,000 gallons of water. Other unique aspects of the Neptune Pool include the oil burning heating system, the light-veined Vermont marble decorating the pools and colonnades, and four 17-century Italian bas-reliefs on the sides of the colonnades. Photo taken August 17, 2012. A wonderful perspective of this very beautiful pool. Marvelous colour combinations. Looks like a beautiful place to visit. Beautifully captured ! A playground for the gods! Beautiful capture and serene view. Great shot showing off the beauty of this pool and wonderful architecture around it. It must be incredibly tempting to try and take a dip in this pool during the summer! Great POV across the pool. Quite the landscaping and luxury. This is a spectacular image showing this amazing building. The water impression is fantastic. I think about how he lived (and some do today as well), and how much good they could have done and do for those less fortunate. Lovely POV and framing. I love the pops of blue throughout. This is absolutely beautiful! Who would want to leave this place! I could sit here and just look at the pool all day! Exquisite ... beautifully captured ... this is one amazing place! Very beautiful indeed, styling from yesteryear. Quite an elaborate setting... the stairways on either side leading up to the terrace is lovely. They sure knew how to relax and enjoy life. Nice detail here Steven, beautiful! A gorgeous capture! A most wonderful series. Ah, yes. Love the Hearts Castle grounds, and pools! Nicely shared.